Pineapples were a symbol of hospitality during the 18th century. So in that case, decorate your space with this wonderful Waterford lamp! Exotic yet elegant, this stunning table lamp features a breathtaking base thats shaped like a pretty pineapple. Youll love how the signature cuts in the lead crystal base perfectly complement the polished brass details. And with a little help from the white shade, this home accent will beautifully diffuse light in your office, guest room or bedroom. Add this lovely lamp to your Waterford collection and give your home a warm and welcoming glow! Material: Base: Lead crystal and brass Shade: Rayon and polyester blend. Shade Dimensions: 7-1/2"H x 10-1/4" Diameter. Bulb Type: One 60-watt Type A bulb (not included). 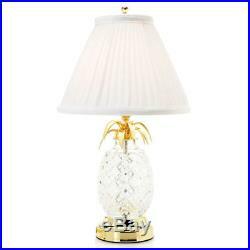 Waterford Crystal Hospitality 18 Pineapple Table Lamp w/ Pleated Shade. This item is new but has been re-boxed into a brown box. Condition: New other (see details) What's in the Box: One Lamp Packaging: Brown Box (no retail packaging). Packages are insured and include tracking at no additional cost. If you would like another size or style please place that order from the inventory available online. Every single customer is important to us and we appreciate the opportunity to assist you with any issues directly. The item "Waterford Crystal Hospitality 18 Pineapple Table Lamp with Pleated Shade" is in sale since Thursday, July 12, 2018. This item is in the category "Pottery & Glass\Glass\Glassware\Waterford". The seller is "worldsbestdeals" and is located in Minneapolis, Minnesota. This item can be shipped to United States.